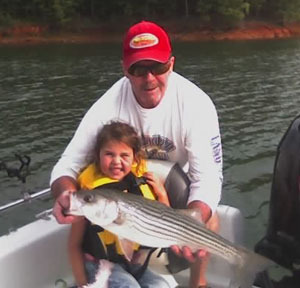 "Robert Eidson is THE Lake Allatoona Fishing Guide. 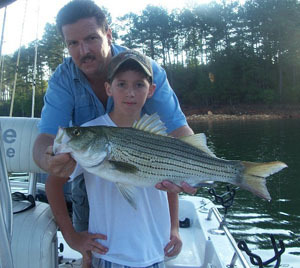 He is everything you could want in a fishing guide on Lake Allatoona. He's GREAT with kids, has a great attitude, and will work very hard to make sure you have a good time. 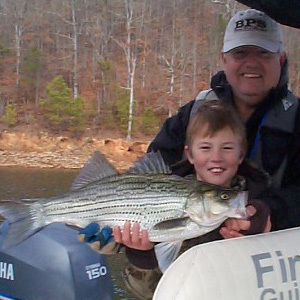 It's easy to tell why Robert is the best fishing guide on Lake Allatoona." — Aaron Sago, Marietta, Ga.
"I've been out with Robert twice in the last two months. 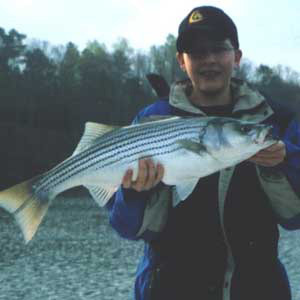 These were my first experiences with Striper fishing and, man, I had fun and learned a lot! Go on a Party Trip with Robert once, and you'll be "hooked". Capt. Robert is patient, knowledgeable and just a fun guy to fish with. His best quality though is that he loves to teach kids to fish. That's why I booked a trip with him in November. My parents are visiting from up North, so we'll have three generations learning to fish striper that day; my parents, wife, two boys and me. "I have had the pleasure of both fishing with and being able to call Robert Eidson a friend for couple of years. 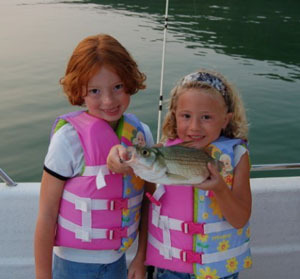 Not only will you catch fish when you are out with Capt. Rob as I did, but you will get a "Doctorate Degree" in how to fish for and more importantly, catch Stripers and Hybrids in the process. It is the best money I spent to shorten the learning curve of how to catch these species of fish. If that wasn't enough, I was fishing with one of the most genuinely nice guys I have ever have the pleasure to share a boat with. He can tell you all you want to know about Striper fishing on Lake Allatoona, Lanier and Carters because he fishes and catches fish on one of these lakes almost everyday of the year. I highly recommend you give him a call to schedule a trip of a lifetime and start counting the days until you receive your "degree"." — Phil Edwards, Marietta, Ga.
"I would highly recommend First Bite Guide Service. Whether your purpose is to catch Stripers or to learn to catch Stripers, Captain Rob works extremely hard to make your trip memorable. Robert has no problems sharing his knowledge of Striper fishing and I guarantee that you will be a better Striper fisherman after spending time on his boat. 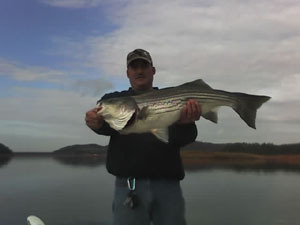 The man truly loves Striper fishing, it is his life, and it shows when you are on a trip with him. "I have fished with many professional guides over the years - In my opinion after a couple of trips, Robert Eidson is the best! He is a great and willing teacher for the avid angler seeking to hone his craft... He is equally awesome with kids and corporate clients that are new to fishing. You simply cannot go wrong with First Bite Guide Service!" 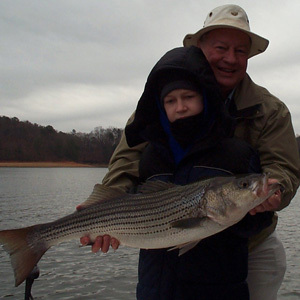 "We thoroughly enjoyed fishing Lake Allatoona with Captain Robert! He really worked to put us on fish. He was very helpful in showing us different techniques saving us a lot of trial and error. He obviously loves fishing and offers a great experience for family and friends. I look forward to my next trip! "May 22 was the best day a fisherman could ask for. I was meeting Capt. Robert Eidson of First Bite Charters at Galts Ferry Ramp on Lake Allatoona. At 6:00am the smoke from the southern wildfires was starting to build on the lake and actually covered the sun at times, but was that smoke from the fires or the fishing techniques of Capt. Robert. I had the confidence that this Capt. was going to show me the ropes of Striper fishing. Not expecting to see him light a fire on the waters surface. 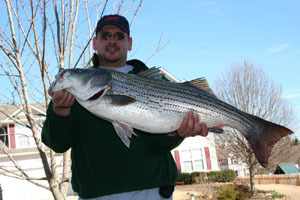 For those that do not know this legend in Striper fishing check out his website www.firstbiteguideservice.com. Capt. Robert makes sure you understand what to do and when to do it let out 100ft ,or hold the rod this way, watch this your going to catch a fish any second! Not any minute but any second. It's like he talks to these fish and he tells them where they need to be to serve up his clients an exciting day on the water catching fish. I was excited when the first fish hit then we had a triple then a quad a few more doubles and then all the singles in between. That's right count them up and 35 fish and 4 hours later I had the best experience of my life in 4 short hours. The best part was he shared so much valuable information with me that I know I'll have a successful trip on my own boat the next time I hit the water. So if you see Smoke on the water look for Capt. Robert and his Sea Pro center console and that Yamaha engine he may be in the next cove catching fish. 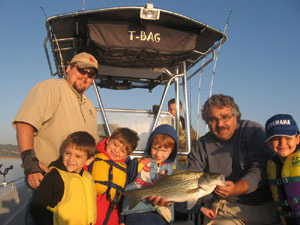 "My son and I have been on guided fishing trips with First Bite four times, we are repeat customers. On each trip not only did we catch fish but we learned how to fish in different seasons and when and how to use different techniques. Even when fishing is slow, Robert Eidson's enthusiasm for the sport will guarantee a good time and knowledge of how to fish for white fish. Take a kid fishing with Robert Eidson and everyone has a good time." 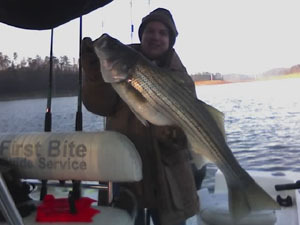 "My friend Corey and I booked a trip with First Bite Guide Service during the spring of 2006. We hooked up with Robert Eidson at the Blockhouse ramp. We were greeted by a friendly and cheerful man. We began fishing with live bait for hybrids and caught a cooler full. He then hooked us up with trolling rigs and we trolled around by the dam area, catching a few nice sized spotted bass. When it was time to head back we were passing through the cut when Robert saw a big school of bigger fish on his depth finder. Our trip just got extended and we began trolling "U" rigs again. We caught over a dozen stripers with none of them weighing less than 15 pounds. Robert Eidson is without a doubt one of the nicest and polite people I have ever met. 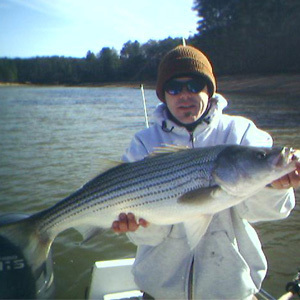 I sincerely think that he is the best striper fishing guide on Lake Allatoona. "My brother and myself did a charter with Robert in June this year. Man what a great time. Robert really put us on the fish, trolling and down lining. My brothers and I do a lot of saltwater fishing in the gulf out of La. so my brother was not big on freshwater fishing until our charter. He is now a firm believer in lineside fishing. He owns his own independent film co. and was so impressed with Robert Eidson that he commented that he would like to produce a video for First Bite, some thing Robert could sell or at least put it on his website. As for me, I'm a huge fan of Roberts, did the party boat last month and had a blast. He is a wealth of info and is not reserved in giving you helpful info. I will certainly book another charter with Robert and advise everyone to do the same.